In the scramble to develop eco-friendly alternatives to fossil fuel-fed boats, wind power remains a strong contender. For US-based wind turbine developer Inerjy, it's a no-brainer: free to harness and store in most coastal or open waters, wind power is not only easy on the environment but also provides benefits such as reduced opex and increased periods between maintenance, as well as being clean and safe for crew to handle. Inerjy is currently funnelling its wind turbine know-how into the development of a new vessel type, the Gemma One. Company president Jamie Schlinkmann tells Ship & Boat International: “It’s pretty bleeding edge as compared to other new technologies, but it doesn’t require any true technology development or hurdles. This turbine has been designed with its blades rotating in relatively slow fashion, to prevent injuries to seabirds and minimise onboard/radiated noise. 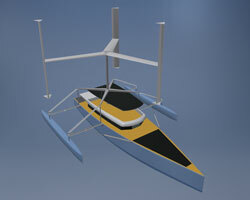 The turbine’s gyro effect should also help to dampen the vessel’s motions, Inerjy predicts. Crew can collapse the turbine’s blade support arms towards each other and lock them together, to minimise the overall vessel beam when she is berthing or transiting a narrow channel. Schlinkmann says: “The blades pass aft of the transom and across the foredeck, several feet from the bow. The bottoms of the blades are kept about 3.6-3.7m above the nearest deck surface: after spending a lot of time under a land-based EcoVert, this seemed a reasonable way to make the turbine hardly noticeable to the vessel’s occupants.” As R&D continues, Inerjy hopes to optimise the design further, to take into account the overturning moment and gyro effect produced by the turbine. Some wind energy captured by the turbine will be routed to the onboard battery banks. For the demonstrator vessel, these will likely comprise 10tonnes’ worth of batteries and associated kit (including connections, electronics, enclosures, etc), rated 2,000kWh. This set-up should grant the Gemma One a top speed of 16knots, with a corresponding range of 200nm, or more than 10 hours. Unlimited range would be attainable at 5knots. Vessel weight is expected to be 30tonnes in lightship mode, increasing to 40tonnes when fully laden. The next step is for Inerjy to appoint its selected yard for the demonstrator vessel, and to test how well the debut Gemma One model performs across a range of tidal, weather and operational conditions.“We’ve had preliminary discussions with ABS, the US Coast Guard and DNV GL,” Schlinkmann reveals. If all goes to plan, the prototype vessel could be completed by mid-2020.